Reese’s Chocolate Peanut Butter Bars are one of those gooey desserts everyone loves! I made this recipe a couple of days ago for a big shindig at church and everyone loved it. It’s a delectable recipe that I found last summer and finally got around to making myself. It has a peanut butter and oatmeal crust and topping with a chocolate filling using sweetened condensed milk. 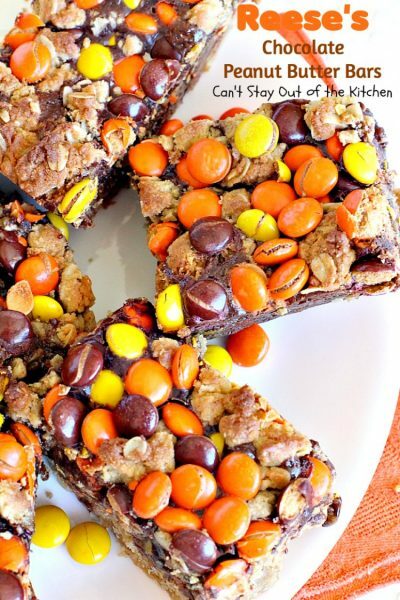 It is topped with Reese’s pieces miniature candies. Oh, my! It is fabulous. I made a few changes to the recipe that I think help the presentation and a few other minor changes, but the basic recipe remains intact. I am warning you in advance that Reese’s Chocolate Peanut Butter Bars are gooey because of the chocolate filling in the middle. But it is worth making. Each bite is rich, decadent and an explosion of flavor in your mouth. Plus it has the crunch from all the Reese’s candies which make it extraordinary. 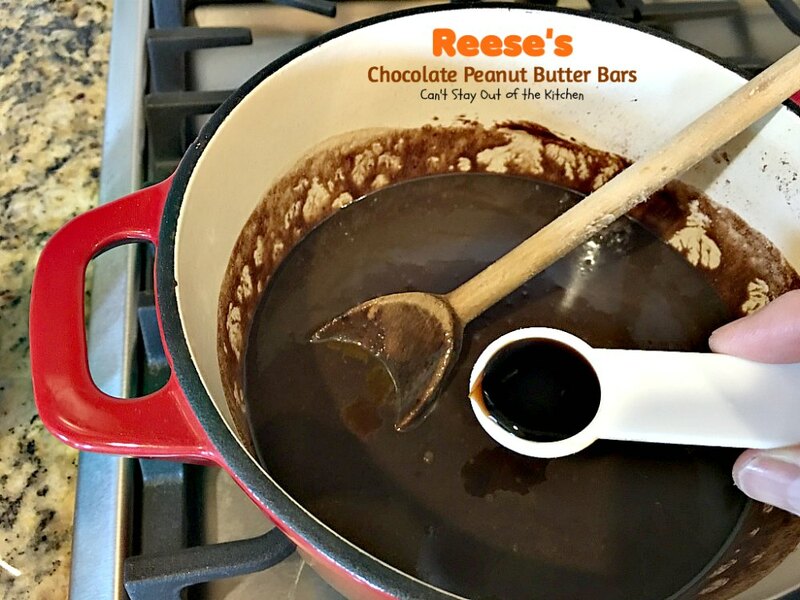 If you’re looking for a wonderful chocolate and peanut butter dessert, then Reese’s Chocolate Peanut Butter Bars has it all! Your friends and family will love these delicious brownies. When I initially posted this recipe in October 2012, it was still the early days of my blog so I was using an iPhone for a camera. The pictures were not as clear as I would have liked so I remade this recipe (June 2016) for some friends. They recently took in a newborn from a cousin who cannot care for the child and are basically starting over. 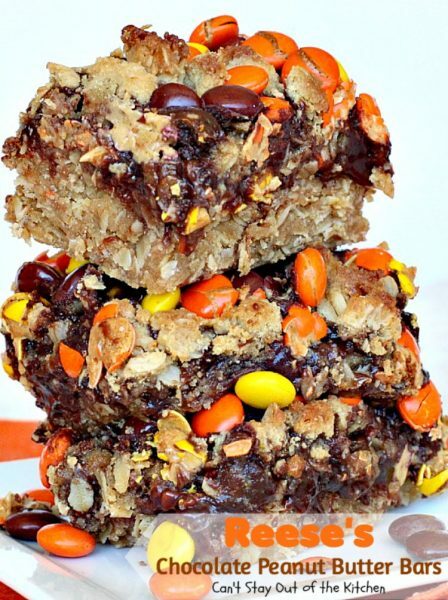 I took over a meal including these delicious bars for dessert. They are ooey, gooey and delicious and if you love chocolate and peanut butter in combination, you’ll be ecstatic once your teeth sink into one of these amazing treats. 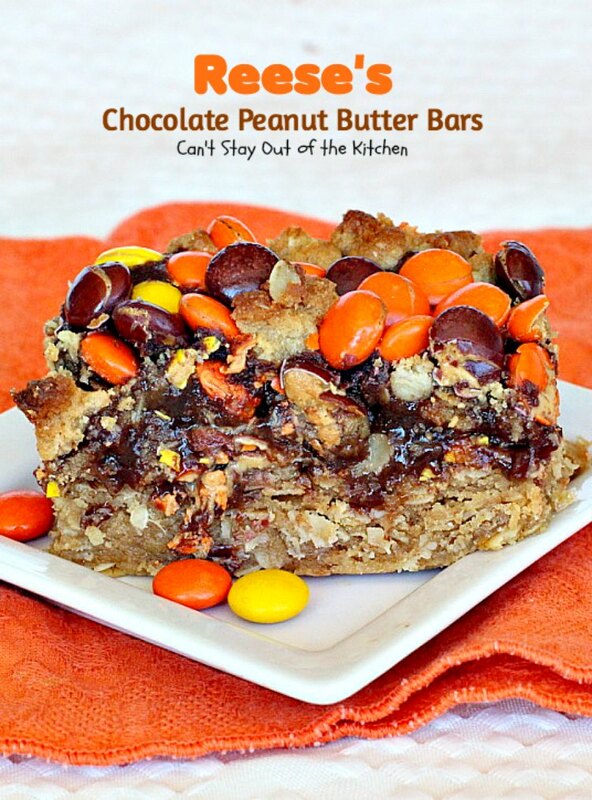 We love these delicious Reese’s Chocolate and Peanut Butter Bars! 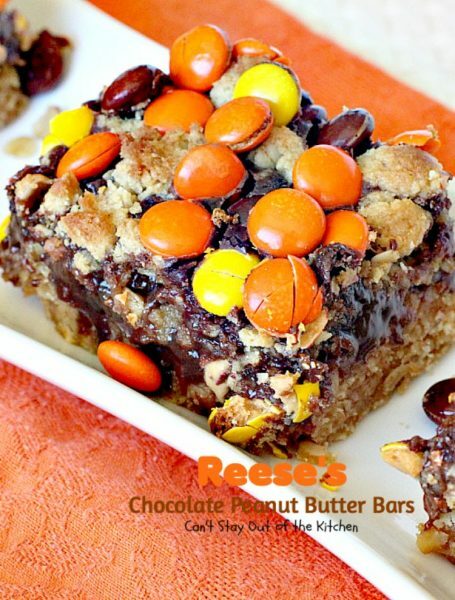 Reese’s Chocolate Peanut Butter Bars are amazing. I chose to put most of the candies on top rather than underneath the topping like the original recipe called for. 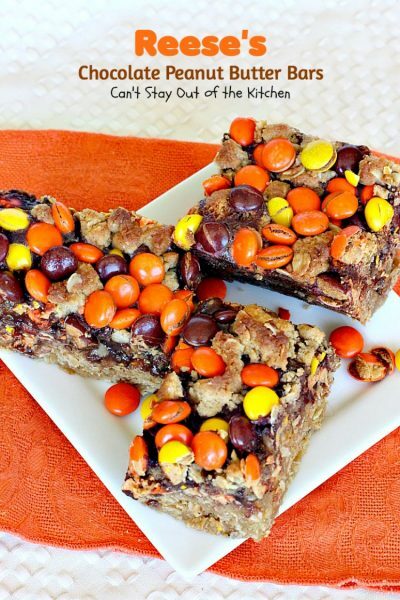 Reese’s Chocolate Peanut Butter Bars are great treats for Halloween or Christmas baking. I used these ingredients for the oatmeal crust and crumb topping. Place softened butter in mixing bowl. 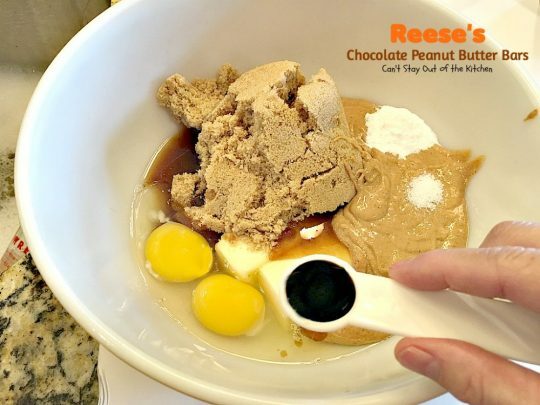 Add peanut butter, brown sugar, eggs, vanilla extract, salt and a heaping teaspoonful of baking soda. I add the leavening ingredients now rather than later to make sure they get incorporated into the mixture completely. 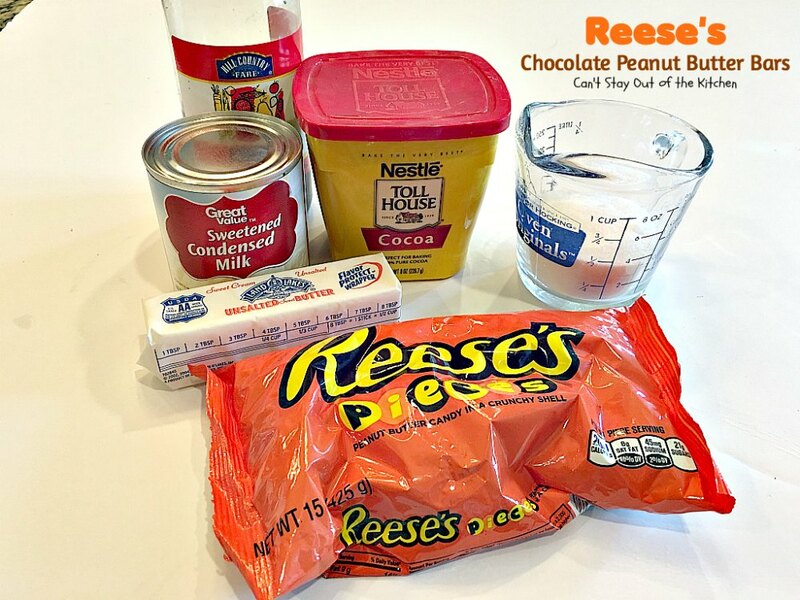 Mix ingredients with an electric mixer or whisk until well combined. Add oatmeal. I prefer using the old-fashioned whole oats. Add the flour. Make sure you always use UNBLEACHED flour for making cookies or cakes as bleached flour, due to the way it is processed, will toughen baked goods. 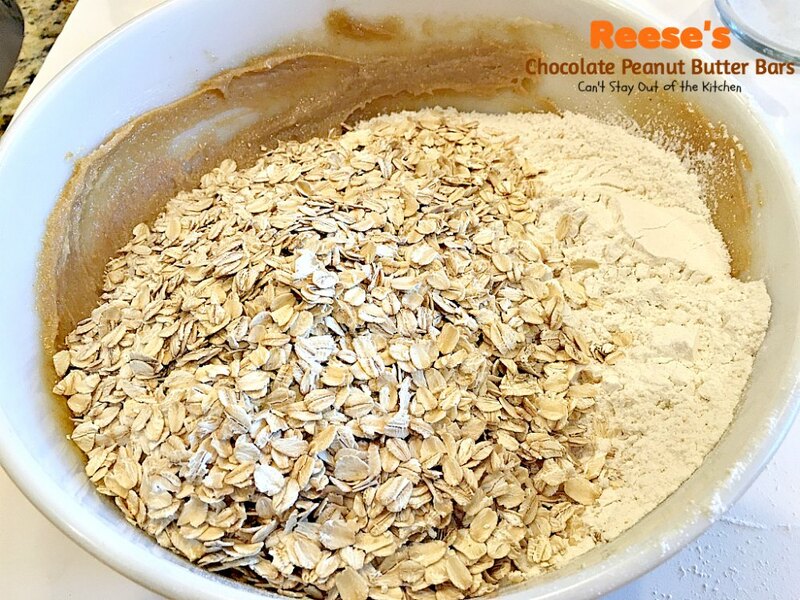 Stir flour and oatmeal gently into mixture to combine. I don’t use electric mixers at this point for cookies or cakes so the texture doesn’t get tough. 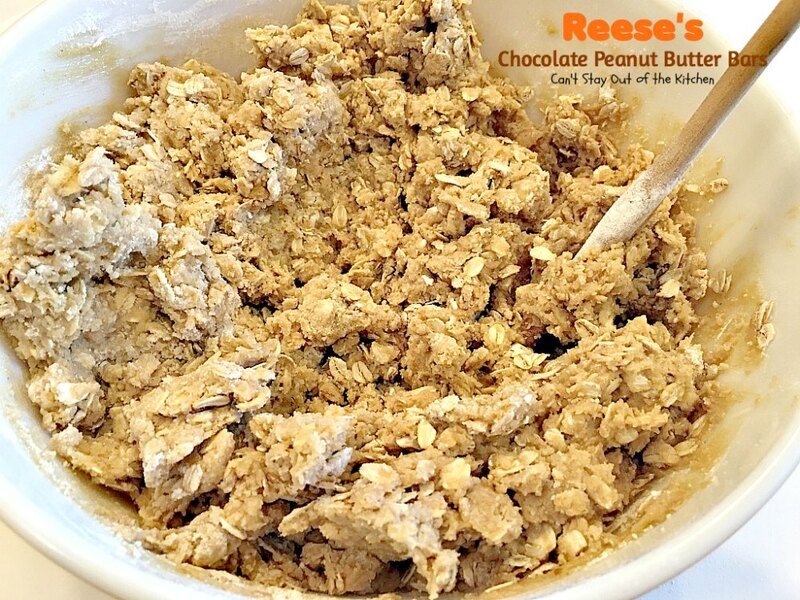 Reserve two cups of the peanut butter mixture and set aside for topping. Press the rest into a greased 9×13″ glass baking dish. I used these ingredients for the chocolate filling layer. Begin making chocolate sauce layer: Melt butter in saucepan over low heat. Add cocoa and sugar. Add a can of sweetened condensed milk. Cook slowly until mixture thickens – this will take about 5 minutes. Remove from heat. Add vanilla. Stir to combine. 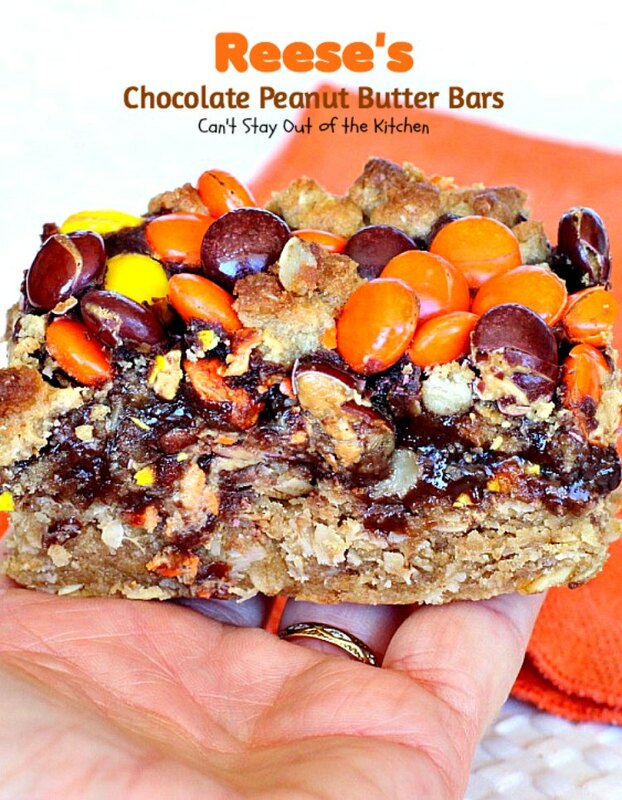 Spread chocolate sauce over top of peanut butter-oatmeal crust. Sprinkle about 3/4 cup Reese’s candies over top of the chocolate layer. Crumble reserved two cups of peanut butter-oatmeal dough over top of the Reese’s pieces. 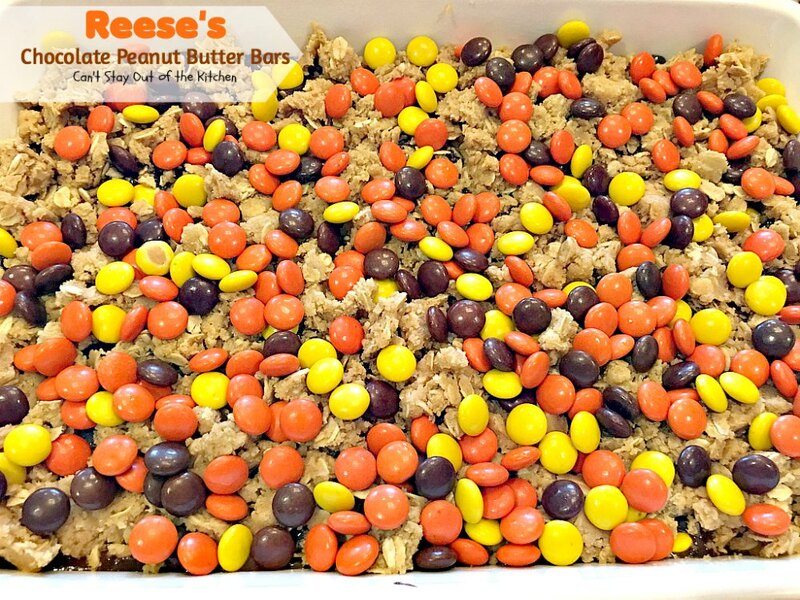 Sprinkle the remaining Reese’s pieces over top of the batter in baking dish. Bake at 350 for 25-30 minutes or until done. I tested with a toothpick to ensure doneness. Be careful you don’t overbake. 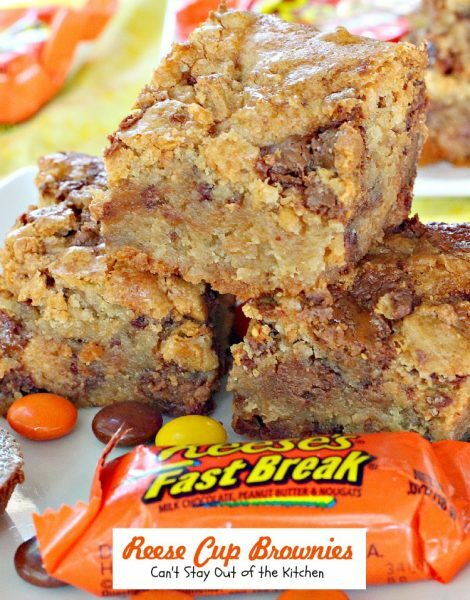 Reese’s Chocolate Peanut Butter Bars are a decadent dessert that everyone loves. 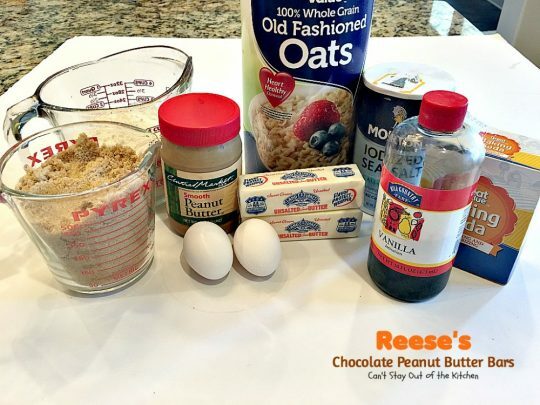 If you love chocolate, if you love oatmeal, if you love peanut butter, and if you love Reese’s candies, you will become addicted to this dessert! These luscious bars are made with an oatmeal-peanut butter crust and streusel topping and a chocolate-condensed milk layer in the middle. 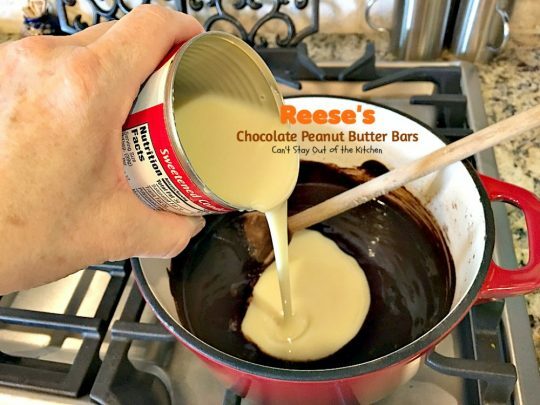 Then they're topped with Reese's miniature peanut butter candies for an incredibly scrumptious treat that's great for Halloween or holiday baking. Beat 3/4 cup softened butter, peanut butter, brown sugar, eggs, vanilla, salt and baking soda until well blended. Stir in flour and oats. Do not beat or mixture will become tough. 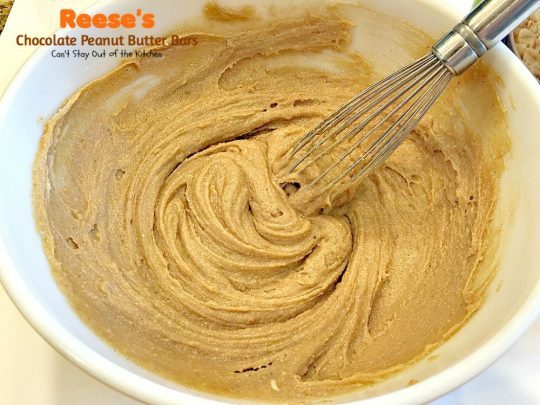 Batter will resemble cookie dough. Set 2 cups of the batter aside. Melt 1/2 cup butter in a saucepan over low heat. Stir in cocoa and white sugar. Add 1 can sweetened condensed milk; stirring constantly over low heat until smooth and thick. This will take about 5 minutes. Remove from heat and stir in 1 1/2 teaspoons of vanilla. Spread chocolate mixture evenly over oatmeal dough in the pan. Sprinkle about 3/4 cup of the Reese’s candies over the chocolate. Crumble the reserved two cups of dough over the candies. 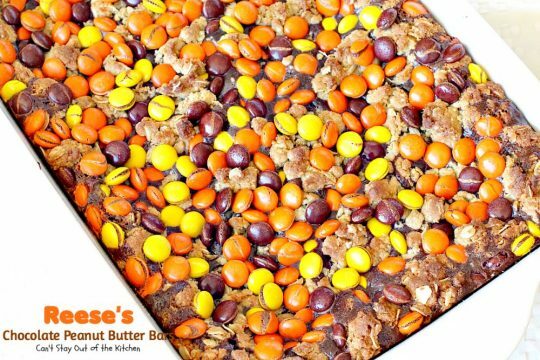 Sprinkle the remaining Reese’s candies over top of the dough. Bake 25-30 minutes or until top is lightly brown. 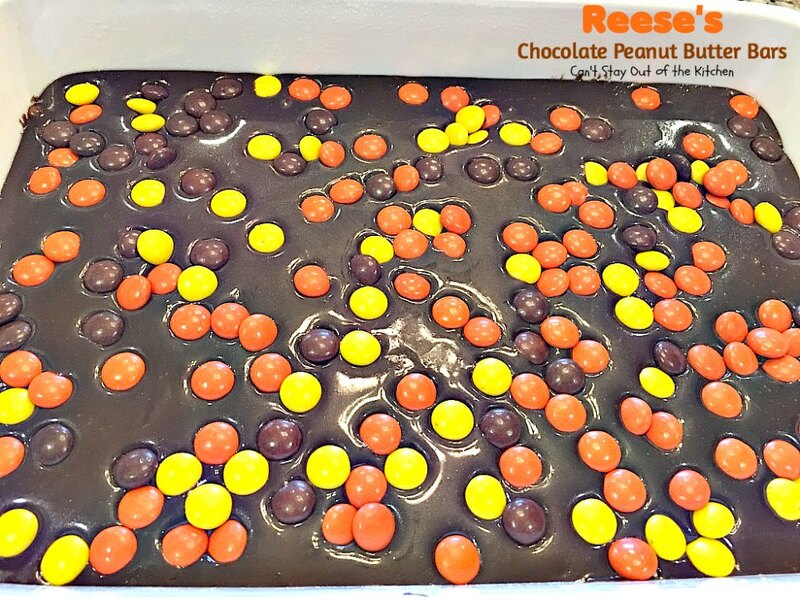 NOTE: The original recipe calls for all the Reese's candies to be sprinkled over the chocolate layer, but I wanted the top to be pretty so I only put a token amount on top of the chocolate and added the rest to the top of the brownie. NOTE: Freezing the cooked bars after cooling for an hour or two will probably make cutting easier and less gooey. Recipe adapted from Random Sweetness Baking. 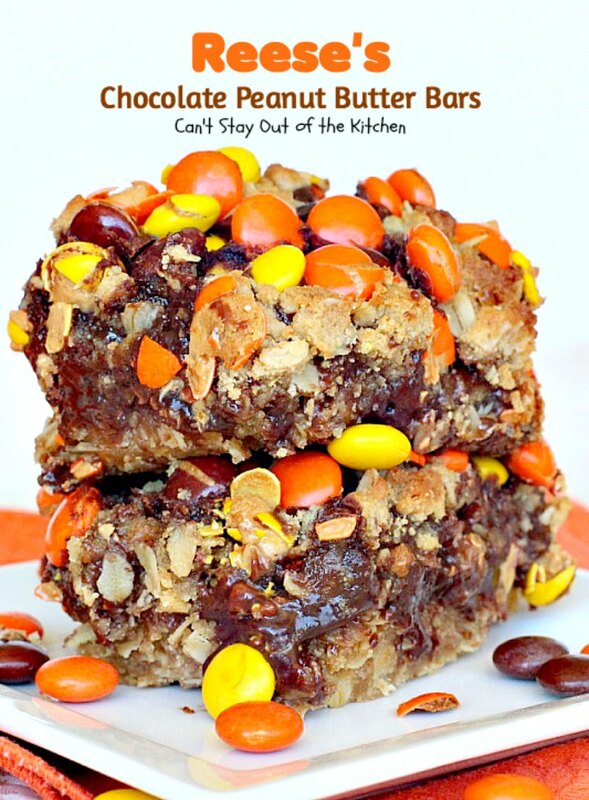 These luscious bars are made with an oatmeal-peanut butter crust and streusel topping and a chocolate-condensed milk layer in the middle. Then they’re topped with [url href=”http://www.hersheys.com/reeses/products.aspx#/REESE’S-Peanut-Butter-Cups” target=”_blank” title=”reese’s candies”]Reese’s[/url] miniature peanut butter candies for an incredibly scrumptious treat that’s great for Halloween or holiday baking. [u]Set 2 cups of the batter aside[/u]. The original recipe calls for all the Reese’s candies to be sprinkled over the chocolate layer, but I wanted the top to be pretty so I only put a token amount on top of the chocolate and added the rest to the top of the brownie. [br][br]Freezing the cooked bars after cooling for an hour or two will probably make cutting easier and less gooey. 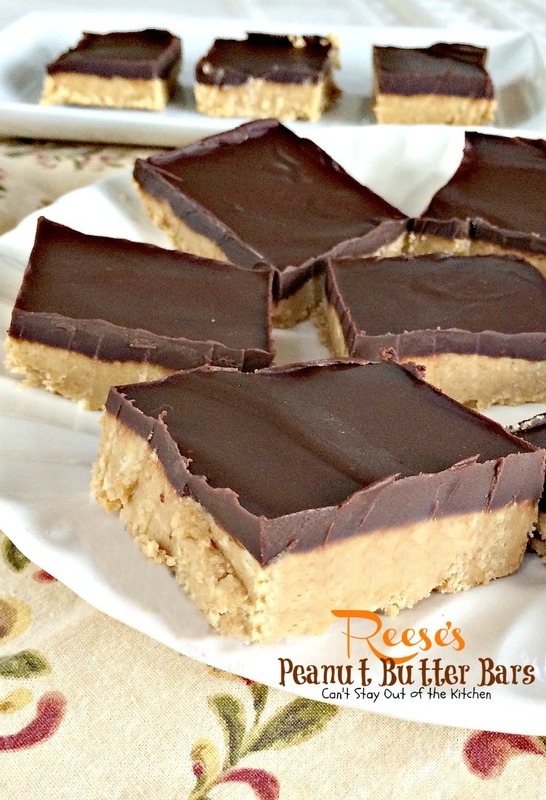 Don’t Reese’s Chocolate Peanut Butter Bars look scrumptious? It’s really hard to stop at just one! 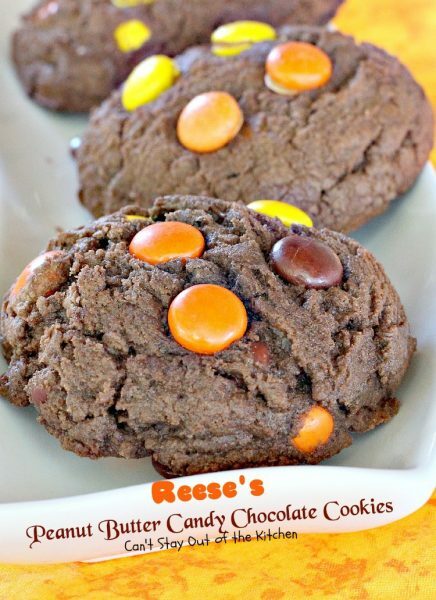 They are ooey, gooey and delicious. 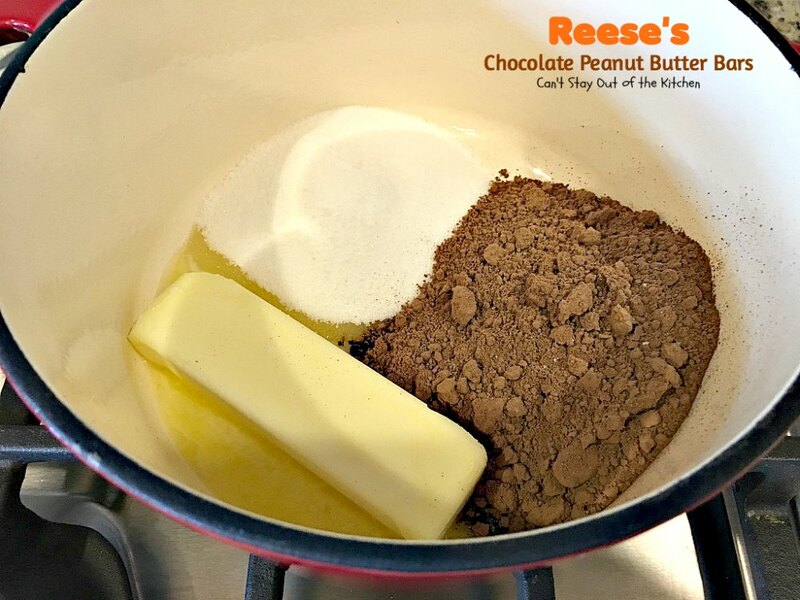 Reese’s Chocolate Peanut Butter Bars are great for holiday baking. My son made this for his daughters family day at kindergarten. They were gone within minutes! I’m so glad you’re family enjoyed these bars, Dana.I love the combination of peanut butter and chocolate! I’m sure your kids will love these. Yeah, the last one on the page had your name on it!